mexico.purplecow.org is in a state of change. mexico.purplecow.org is always in a state of change. At least, the web content isn't exactly nailed down to tight specifications. Change is good. The most recent change is permitting the search engines to take a peek at the web content. Exciting stuff. We'll see how that pans. It can be somewhat boggling to see how hard Cuil tries to index content. You may find the mexico pastebin here, and the mexico local version of Goosh here. 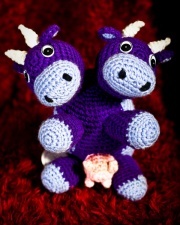 The mexico site at purplecow.org provides a range of odd services and resources. Most of these are not located at any web instance yet. A variety of small content is hosted here, including some picture Galleries and PCOWtools. The default MW main page text can be found at Original Blah. Want to add content? Sure thing. Just ask for a login by email or on IRC. The following pages will take you to file lists. Yes, we had an unscheduled outage on the evening the 6th of June, 2009. It doesn't tend to happen very often, but one can never trust machines, right? If you can't work out where to send comments or content requests or anything else, there's a problem that can't be solved very easily. Work on it. Yes, the theme was based on the Blender theme. If you require the source, it's still available at blender.org or you can email and ask for it. No real changes, just new graphics - and they're not GPL. 1.1 is in a state of change.